• More London – set close to Tower Bridge with a view of Tower of London, enjoy pop up wooden cabins selling all manner of treats. 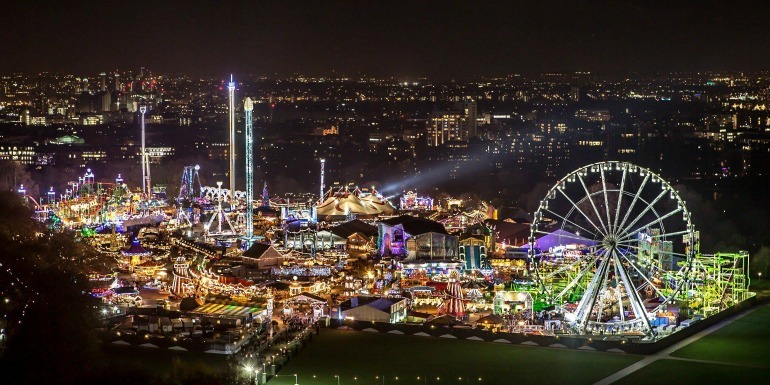 • Winter Wonderland – set in Hyde Park, always popular with younger visitors as there are a variety of fairground rides as well. Hype Park Winter Wonderland. Photo Credit: © James Burns via Winder Wonderland. • Somerset House – the building provides a spectacular backdrop, it’s often used as a filming location, and the terrace offers amazing views over the River Thames. • Tower of London – home to the Crown Jewels and Beefeaters. • Natural History Museum – London’s prettiest building? World famous dinosaur exhibit. • Canary Wharf – an amazing regeneration project in the East End of town. 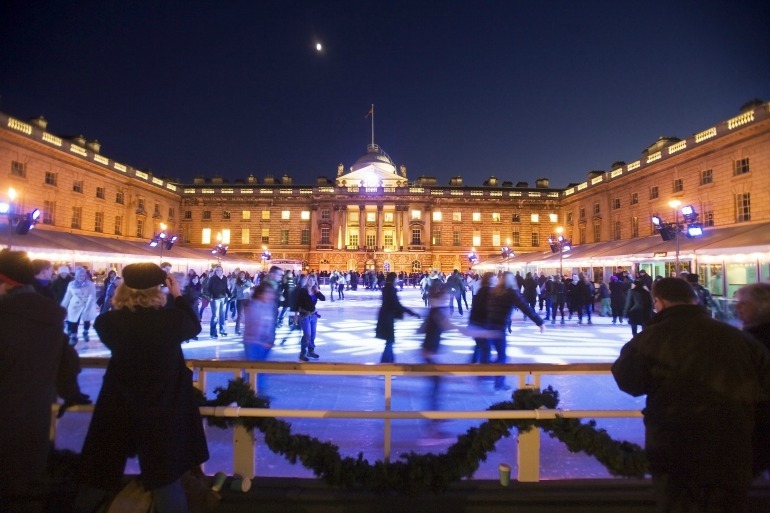 Somerset House – Ice Skating. Photo Credit: ©London & Partners. Kew Gardens, a giant Botanical Gardens, set on the edge of London has an absolutely enchanting light trail. This gets bigger and more popular every year. A firm favourite with Londoners, especially families with children. • Carnaby Street – one of the spiritual homes of the swinging Sixties. This year the lights show the carnival colours of Rio de Janeiro – the first for London. 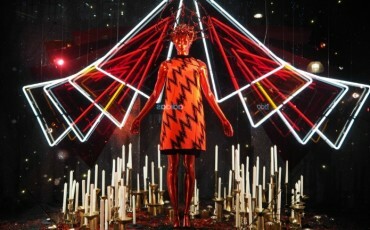 • The Strand – beautiful lights set in a big entertainment and shopping district. • Sloane Square – exquisite lights and a great part of town for interesting shops. 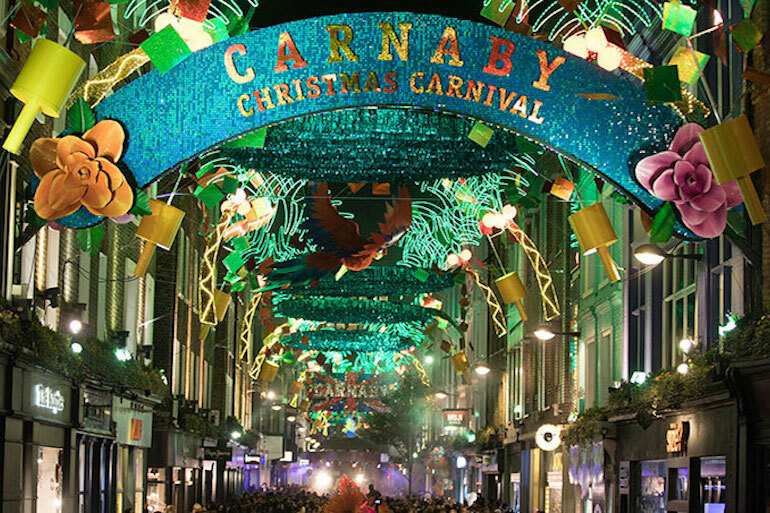 Carnaby Christmas Carnival 2017. Photo Credit: © Reed Exhibitions Limited via Carnaby. The run up to Christmas is hectic. People are rushing round doing last minute shopping but from Christmas Day itself until the New Year, London is less busy than usual so this can be a great time to explore. Guide London provides friendly and informative Blue Badge Tourist Guides who can customise your itinerary to make sure you get the most out of your time here. • Royal Borough of Greenwich – Prime Meridian, stand with feet in different hemispheres, Maritime Museum and some of the best views anywhere in London. • East End – Spitalfields and Shoreditch offers a buzzing, hip part of town with great shopping, it’s ‘Flat White’ culture and street art. • Notting Hill – lovely, village type area with pretty houses and shops. 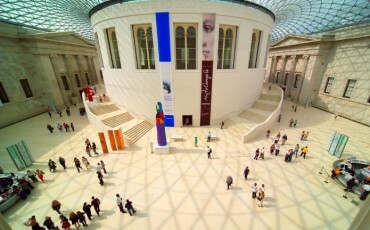 Where Julia Roberts met Hugh Grant. 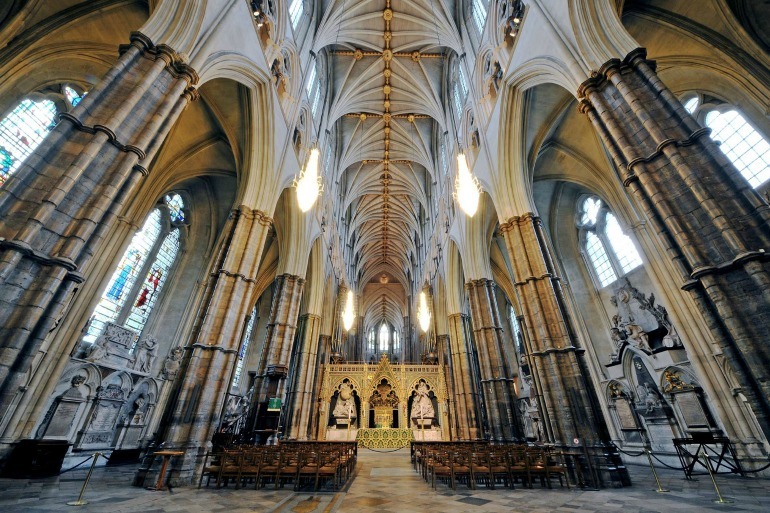 Westminster Abbey – Sanctuary and the Quire. Photo Credit: © Westminster Abbey. With the pound at 30 year lows, this is a great time for overseas visitors to shop, especially with the Christmas Sales starting straight after Christmas has finished. • Hamleys – known as the best toy shop in the world. In store demonstrators, will be busy keeping kids amused. 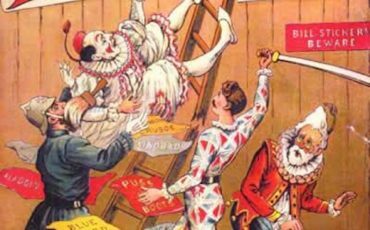 • Benjamin Pollock’s Toyshop – one of the oldest toy shops in London where you look for something a bit more traditional. • Benjamin Pollock’s Toyshop – if you’re looking for something a bit more traditional. • Lego Store – the world’s largest Lego store has just opened in Leicester Square. • Burlington Arcade – situated on Piccadilly –small exclusive shops in a beautifully styled arcade. • Duke of York Square – just off the King’s Road Chelsea – eclectic mix of smaller shops as well as Saatchi Gallery (modern art). • Seven Dials – just North of Covent Garden, wide variety of boutiques, cafes and restaurants. Whatever you choose to do, London will welcome you with open arms. Happy Holidays! Burlington Arcade. 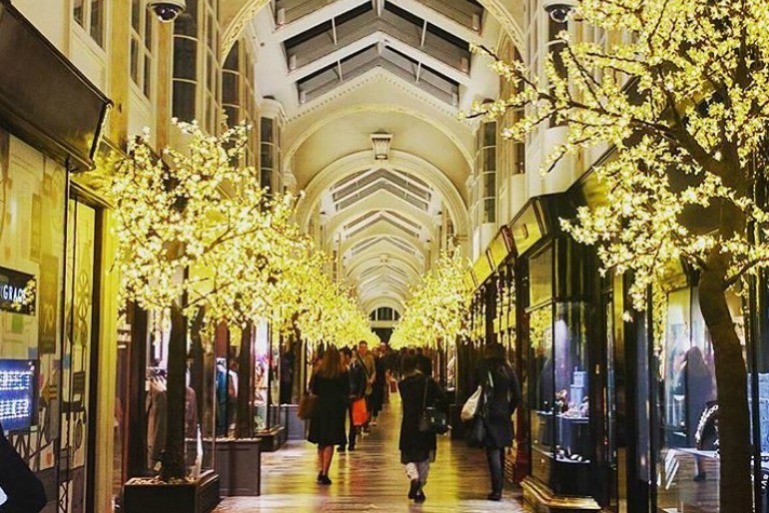 Photo Credit: © Burlington Arcade. Welcome to London! I am a Blue Badge Guide with a love of travel and meeting new people.